March of 2018 saw the sixth rise of the federal funds rate — and, thus, the US Prime Rate — since 2015, a marker of the continued growth of the US economy since its lows in the late 2000s. But while economists may hail the increase as a positive sign, average consumers may not feel so positive about an increase in their interest rates — particularly not the 50% of consumers with credit card debt that just got more expensive. And we’re not talking about an insignificant amount of debt, either. Total revolving debt in the US has reached an all-time high, coming in just a little under $1.03 trillion by the end of January. 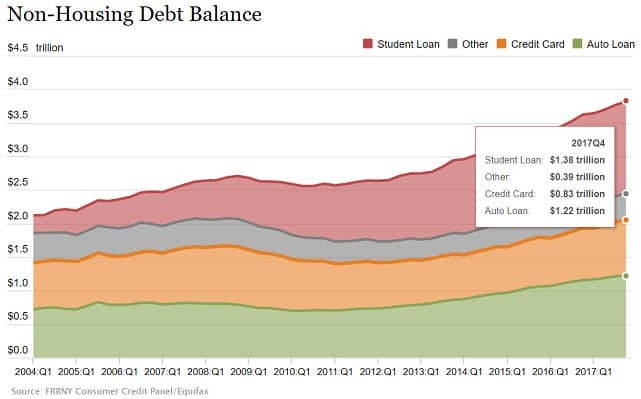 Of the more than $1 trillion worth of revolving debt balances Americans are carrying in 2018, the vast majority is credit card debt. 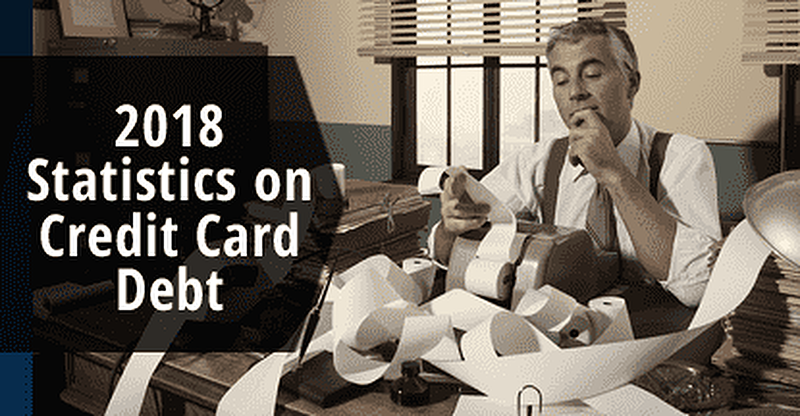 The total amount of debt carried as credit card balances hit $830 billion at the end of 2017. While not an all-time high, the $26 billion jump to the $830 billion mark in the fourth quarter of last year was the third such increase in 2017, giving a total annual increase of $50 billion since the end of 2016. This graph from the Federal Reserve Bank of New York’s Center for Microeconomic Data shows the non-housing debt balances by debt type. Given the 126.2 million American households, the average household has around $8,161 in revolving debt, approximately $6,577 of which is credit card debt. With nearly 248 million Americans over the age of 18, that comes out to a total of $3,353 in credit card balances per US adult. Of course, not every consumer carries a credit card; only around 70% of Americans have at least one card, which amounts to about 173 million cardholders over the age of 18. Spread out among those with credit cards alone, the average cardholder has approximately $4,789 in credit card balances. For some of the consumers holding credit card debt, that debt is fleeting; one study found that an average of 39% of cardholders always pay their credit balances in full each month. The Consumer Financial Protection Bureau (CFPB) survey shows less than 40% of consumers always pay credit card balances in full. At the same time, around 29% of cardholders make low payments at or near the minimum payment most months. But it’s not always the consumers you think it will be. For example, while those with FICO credit scores above 700 are certainly more likely to pay their full credit card balance every cycle, even those with scores above 800 will make a low payment around 20% of the time. Overall, the amount of debt seems to be the best indicator of how much is paid, with balances under $1,500 more likely to be paid in full, and those over $2,000 more likely to receive just the minimum payment. Other patterns in the data emerge when looking at factors like income, age, and region. The correlations between income and credit card debt seem to show that money doesn’t necessarily buy debt freedom. In fact, average credit card debt appears to increase with annual income, and those with the largest income have the highest credit card balances. This chart from the paper “Minimum Payments and Debt Paydown in Consumer Credit Cards” shows the correlation between income and tendency to pay balances in full. Similarly, credit card debt may also be a factor of household net worth at both ends of the spectrum. , Those with the highest net worth households carry almost the most debt — with the exception of $0 net worth households, who carry the most. As might be expected, those with the highest incomes — $150,000+ annually — are the most likely to pay their credit card balance in full each month. However, they may still make minimum or near-minimum payments as much as 38% of the time. In comparison, those with incomes less than $50,000 will make low payments about 50% of the time. Cardholders with incomes less than $25,000 are the least likely to pay in full. Another study found that the type of employment can also impact the amount of debt carried, with self-employed workers paying a larger amount of interest each year from revolving credit card debt. Retired workers paid the least amount of credit card interest. 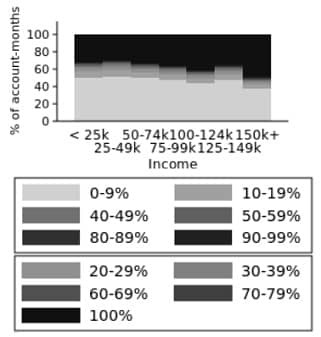 While not as obvious a factor as income, age also seems to be a correlating element, with older consumers more likely to pay their credit cards in full, and middle-aged consumers equally likely to pay in full as make the minimum payment. Data from Experian’s State of Credit: 2017 shows the middle generations carry the most credit card debt. A good portion of the correlations between age and credit card debt is likely due to the cost of living, as those in their middle adult years are more likely to have home-related expenses and have dependents than those in older and younger demographics. Homeowners tended to pay twice as much credit card interest per year as renters. The role of gender in credit card debt is more variable, with one survey saying men carried more debt, and others saying women are the more frequent debt holders. Another interesting credit card debt influence was found to be location, with regional patterns in both the amount of credit card debt as well as the average credit score. 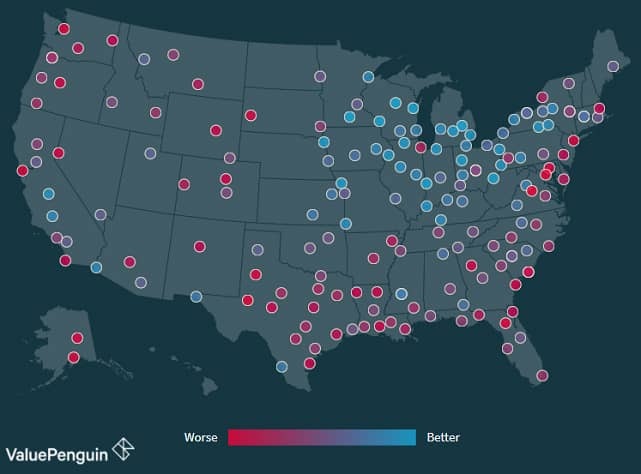 The Midwest and Great Lakes regions seem to be where to find the most responsible credit card users, home to both the lowest average credit card debts and the highest average credit scores (which belong to Iowa and Minnesota, respectively). ValuePenguin’s chart shows the states with the highest and lowest average credit card debt. That said, the New England area also shows lower credit card debt numbers than other regions, as well as being home to three of the 10 states with the highest average credit scores. Alaska is home to the consumers with the highest average credit card debts, sporting more than 20% more debt than the next-highest state of Colorado, though Alaska’s credit scores tend to be middling. The lowest credit scores of all are found in Mississippi. While Alaska has the highest debt, the trend of high credit card debt is definitely most prominent across the southern and western states. The South is also where most of the lowest credit scores are found. Despite the large amount of credit card debt most of us seem to carry, the actual number of cardholders defaulting on that debt remains fairly low — hovering around 2.5% — which is especially good when compared to post-recession highs. For those consumers who make up the large number of people paying less than their full balance each month, there are several ways to make your monthly payments more affordable. One popular method of making credit card debt more affordable is to lower your interest rate, thus decreasing the fees you’re charged each month. If you just need a small drop or have shown credit improvements since you got your card, you may have success requesting a lower rate from your issuer; one study found 69% of people were able to negotiate a lower rate with their issuer. If this doesn’t work or you want an even lower rate, one of the easiest ways is to make a balance transfer to a card with a 0% APR offer. The best offers, like our favorites below, can extend for 12 months or more. The vast majority of credit cards — 89%, to be exact — will allow balance transfers, and around 41% of cards offer lower introductory interest rates to new cardholders. One thing to watch out for, however, is that balance transfers will almost always come with fees. Only about 9% of credit cards don’t charge a balance transfer fee, which means you could be stuck paying 3% to 5% of your total transferred balance as a fee for the service. If a balance transfer won’t cut it, the next best thing may be to consolidate your credit card debt with a personal installment loan. This may be the case particularly if you have too much debt for a balance transfer, or if your credit won’t qualify you for a decent offer. In most cases, installment loans can offer significantly lower interest rates than a typical credit card, though your rate will depend on your credit. Using an online lending network, like our picks below, can help you find the lowest rates for you by connecting you with multiple lenders at once. Successful credit card consolidation can not only reduce your interest rate and monthly payments, but can also turn multiple credit card payments into a single loan payment, simplifying your finances. As a result, as much as 52% of consumers with $6,000 or more in credit card debt have used consolidation to make debt repayment easier. The biggest reason those with high debt avoid consolidation is the fear that it will negatively impact their credit scores (25% of respondents), while worries about getting scammed are also strong (24% of respondents). In both cases, being sure to do your research before embarking on your credit consolidation journey can help allay your fears and smooth the process. Always investigate a financial institution before entering into an agreement. The federal funds rate is set to rise at least twice more in 2018, which will almost assuredly mean corresponding increases in the US Prime Rate upon which variable APRs are based. But while the increases are a sign of a growing economy, they also come at a time when we have a steady growth of credit card debt, and each increase can make that debt more expensive to carry — and to repay. To avoid becoming a negative credit card debt statistic, be sure to always use your credit cards wisely, including paying in full (and on time) each month. Healthy credit card habits can build your credit profile and make your financial life easier, turning you into a good credit card statistic. What is the Average Credit Card Debt in American Households?